Renowned for its heavy crops of sweet whitecurrants, White Versailles is a popular choice for less favourable, damp and shaded areas of the garden where other fruit may struggle. The juicy translucent whitecurrants can be eaten from the bush, frozen whole or used in pies, jams, jellies and more. This attractive fruit bush with pale green flowers in spring and slightly arching branches can be grown against a wall or fence, or used as a low hedge, ideal for bordering vegetable plots and allotments. White Versailles is a fantastic choice for fruit lovers! Soft fruit bushes can be planted close together to create a ‘hedge’ of fruit, or at approx. 1m apart to allow for the individual bushes to stand alone. 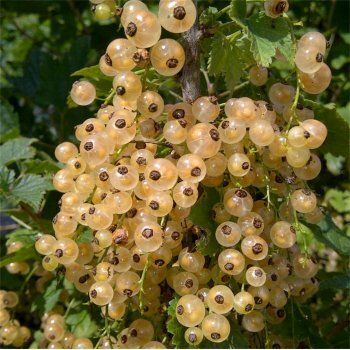 When planting soft fruit bushes, such as a White Versailles White Currant Bush, it is important to prepare the planting area well. Pot grown soft fruit bushes can be planted at any time of the year. Bare root soft fruit bushes need to be planted between November and March. If you are not planting your bare root soft fruit tree straight away, it is best to ‘heel in’ your tree. Dig a hole in an unused area of soil and pop the roots of the tree in, gently firming around. If you’re planting within a couple of days, you can untie the bag around the roots, water, re-tie and then store in a frost free garage or shed. Whether planting a pot grown or bare root soft fruit tree it is important to prepare your planting site well. Start by removing all weeds and grass within a metre of your desired planting hole. Then dig a hole slightly deeper than your root mass and approximately 2x as wide. We recommend digging a square hole as this encourages the roots to grow straight as opposed to around inside the hole. To help your tree establish more effectively, we advise applying root grow (sprinkle in the hole for pot grown plants or prepare and apply the gel mixture for bare root plants), especially if you have poor soil. Gently loosen the roots and place into the planting hole. Using 50% of the original soil and 50% compost (avoiding multi-purpose), fill in the hole and firm around gently. Make sure not to bank the soil up around the collar of the tree as this can cause problems. If you’re planting in dry weather, water well and regularly for the first few months. The same goes for spring and summer planting. Make sure to keep an eye on your young fruit bushes and increase watering if there are extended periods of hot or dry weather. If you’re planting in autumn, you may only need to water your tree a little. To check if the soil requires further water, dig a finger down into the soil, a few centimetres and if the soil feels even slightly moist, it does not need further watering. If it feels dry, water and repeat this test again. Once you see your fruits begin to swell, water again. We also stock a range of irrigation kits, suitable for a variety of planting schemes. Soft fruit, including gooseberries, red currants and white currants require some formative pruning followed by a small amount of annual maintenance. In the first year, during early spring, select 5 or 6 main stems and trim back to approximately 15-20cm. Remove the remaining stems by pruning back to 1-3 buds from the ground. In the following year, during summer (June to July), prune back the current year’s growth to approx. five leaves. Soft fruit bushes fruit on older wood so you should not be removing any fruit from your tree, only new growth. Then, in winter, remove all dead or damaged shoots and cut back the side shoots to about 1-3 buds from the base. Shorten the remaining branch tips by a quarter. Repeat this pruning regime each winter from then on.